By ordering directly from us, all proceeds go to support sacred music at St. Mary’s. 6.35% sales tax will be added for Connecticut residents. Please note that the international shipping charges for the above-listed destinations will be added in PayPal checkout. For information about shipping orders to other countries not listed above, please contact us. Discounts available for orders of ten or more CDs. For more information, please contact us. What music is included on the CD? What is the “Mass at Dawn”? What does “Lux fulgebit” mean? What is the Mass Christe Jesu? The CD is the “soundtrack” of a sung Mass as it is done at St. Mary’s Norwalk on Sundays and feast days. Everything musical that takes place in the Mass is included, from the bells to the organ, the chant, and the choral polyphony. The readings and chants all come from the Mass at Dawn of Christmas Day, and the polyphony featured is the Mass Christe Jesu by William Rasar, with motets by William Byrd, Alfonso Ferrabosco, and Walter Lambe. The Mass at Dawn is the second Mass of Christmas Day. Most feasts in the Roman rite have one proper set of readings and chants, but Christmas, almost uniquely, has three sets: one to be sung at midnight, one at dawn, and one for masses during the day. The Masses for Midnight and during the day have been recorded numerous times before, while the Mass at Dawn is less commonly heard. 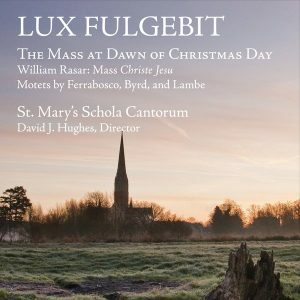 “Lux fulgebit” is from the first line of the proper texts for the Christmas Mass at Dawn. The Introit for the Mass begins with “Lux fulgebit hodie super nos” (“A light shall shine upon us this day”), a line from Isaiah’s prophecy of the coming of the Messiah. This is the culmination of the imagery that pervades Advent (the four weeks preceding Christmas), which depicts the world in darkness, longing for the dawn, and repeatedly figures the birth of Christ as the light in the East. At this special Mass, these words are to be sung just as the sun is rising. A light shall shine upon us this day: for the Lord is born unto us: and He shall be called Wonder-Counselor, God-Hero, Father-Forever, Prince of Peace: of Whose reign there shall be no end. The Mass Christe Jesu is a sixteenth-century English setting of the Mass Ordinary for five voices, which is found complete in the Forrest-Heyther partbooks (Bodleian Library) and incomplete in the Peterhouse partbooks (Cambridge University Library). It is the only extant composition of William Rasar, and is of very high musical quality. The model of the Mass is unknown or lost, and there are a couple of other features of the Mass that are unusual for the period: the entire text of the Gloria and Credo are set, and the Mass is entirely in duple meter. William Rasar is an obscure composer who was active in the early sixteenth century. The only dates known with certainty about him are his tenure as a boy chorister at St. George’s Chapel, Windsor, from 1499 to at least 1504, from which his birth year can be estimated as 1491, and his time as a clerk at King’s College, Cambridge, 1510–c. 1515. His only known surviving composition is the Mass Christe Jesu, which survives in two sets of partbooks. For more about the revival of the Rasar Mass, view the CD Launch program or the CD liner notes.